Museum opening hours: 9.30 to 19.30 daily from April to Mid-October, 10.00 to 18.00 Monday to Saturday from Mid-October to April, 10.00 to 14.30 on Sundays and bank holidays. We are comparing FC Barcelona Stadium Tour & Museum Tickets Prices from leading ticket suppliers and Try to find you Cheap tickets prices on the market. 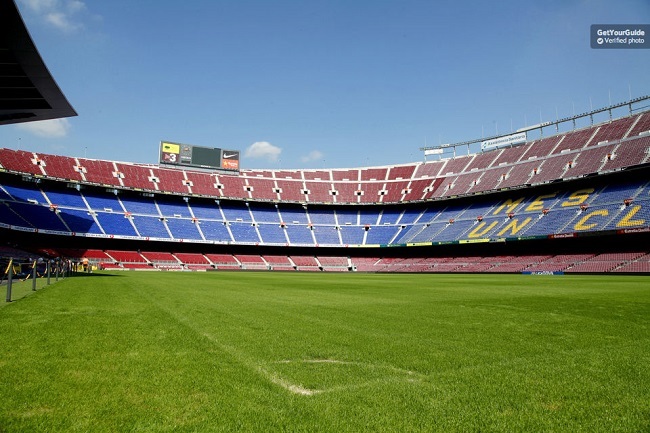 Footy fans gather round and get your tickets for a backstage visit to home of FC Barcelona, because to opportunity to tour the rooms and corridors of Camp Nou. Combined with skip the line entry and access to the stadiums museum, this experience simply can't be missed! Your tour will be split into two parts, visiting Camp Nou and the interactive museum. On a self-guided visit of FC Barcelona Camp Nou stadium you can take in the size of the largest football stadium in Europe. Climb through the stalls to see the pitch from above and snap a few memorable photos. Turn away from the football field and follow the tunnel to the players locker rooms, the same space used by the likes of Ronaldinho, Maradona, Cruyff and more. This ticket also gives you access to the onsite museum where you can use the interactive displays to learn about the history of the FC Barcelona stadium and the team. Stop by the press room and commentary boxes in the TV studio complex and take your time to discover the multimedia space. A visit to the FC Barcelona Stadium is a must for all sports and football fans. Both adults and children can enjoy the interactive museum. Not suitable for anyone with walking difficulties. Your Experience With FC Barcelona Stadium Tour & Museum Tickets? Visit Europe Largest football stadium, home to FC Barcelona, and walk where your sporting heroes have on a visit to Camp Nou. Become a Barcelona expert with a visit to the clubs' onsite museum, access the history of FC Barcelona and its players, their wins, losses and shootouts. Benefit from priority skip the line entrance, freedom to roam the museum at your own pace and learn about the team with interactive audio-visual media. What FC Barcelona Stadium Tour & Museum Tickets Includes? Skip the line entrance tickets to FC Barcelona Stadium, including visit to Camp Nou and the stadium museum. Tour of Camp Nou – independent visit to the FC Barcelona Museum. Travelers Reviews about FC Barcelona Stadium Tour & Museum Tickets? A 4.5-star tour according to TripAdvisor, Viator and Get Your Guide users. Travellers have left mostly 5-star reviews for this combo ticket. Comments say that the stadium and museum are well worth visiting. Reviews point out that this tour is unmissable for FC Barcelona Fans and also great for children. Your voucher must be exchanged for entrance tickets at Julia's Travel Office, otherwise you will not be permitted to enter. Cancellation policy depends on individual tour providers, some will issue full refunds up to 24-hours prior to departure however some may charge a 50% to 100% cancellation fee. Camp Nou tour will not take place on days when FC Barcelona are playing at home. Museum opening times are subject to changes: on home match days the museum and stadium complex will close 3 hours prior to match start time, it will re-open approximately 1 hour after the match has ended. Closing time will be at 15.00 for matches in the Champions League. Please DO NOT walk on the football pitch. Valid ID may be needed to enter the stadium. Departure point: entrance to Camp Nou, Barcelona. Ticket collection point: Julia's Travel Office, Carrer de Balmes, 5, Central Barcelona.